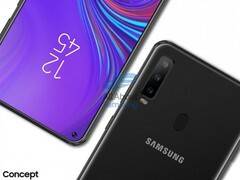 The Samsung Galaxy S10 phones are still months away from an official announcement, so Samsung is set to sate the desires of its expectant fans with the upcoming Galaxy A8s, a sub-premium phone with an impressive specifications sheet. While the S10 phones may be the center of attraction, Samsung is set to offer something a tad less impressive soon, in the Galaxy A8s. Details of the sub-premium Samsung phone have now surfaced. According to the source, the A8s will sport a 6.39-inch FHD+ display. The A8s’s display may just be its most interesting feature. For one, it will be Samsung’s first implementation of the Infinity-O display. Even more interesting is the fact that sources claim it will be an LCD display, and not an AMOLED one as we’ve come to expect from Samsung phones. Most Samsung devices sport AMOLED displays—Samsung Display is the biggest producer of mobile OLED panels after all—and the shift to LCD on the A8s is unexpected. Reports also claim that the display will not be made by Samsung at all, and will instead be supplied by Chinese display makers BOE. The Galaxy A8s is said to be powered by a Snapdragon 710 and will feature 6 GB of RAM and 128 GB of expandable storage. Supplying the device with power is a 3400 mAh battery, with USB Type-C and Quick Charge keeping the charging process swift. Camera-wise, the A8s will feature three rear cameras. We already saw a tri-rear camera setup on the A7—and a quad-rear setup on the A9—so this isn’t much of a surprise. It’s expected to feature a 24 MP + 10 MP + 5 MP lineup at the rear, and a single 24 MP sensor at the front, nestled in the cutout. The device’s rear is also expected to house a fingerprint sensor.